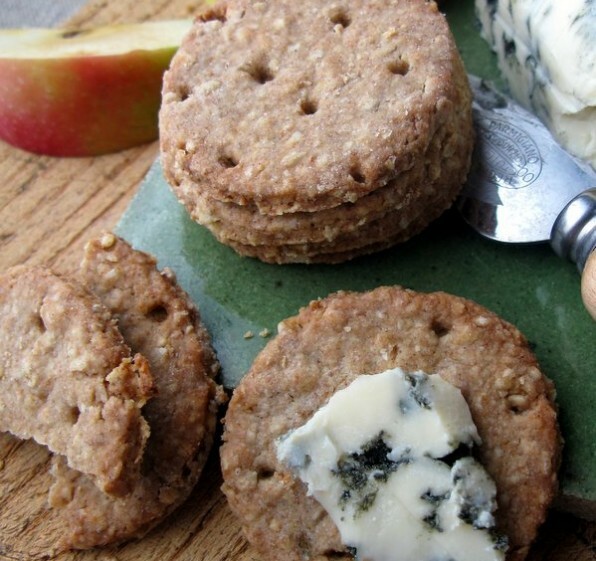 Neither a cookie nor a cracker, these Ginger Whole Meal Biscuits are the kind of not-too-sweet cracker that goes well with cheese or a cup of tea. The type of flour you choose impacts the flavor of the biscuits. I always use stone ground whole wheat for its nutty taste and either buckwheat or rye equally as the accent flour. Powdered ginger enhances the biscuits’ mild sweetness. With the ginger, I think they are perfect accompaniment for a strong blue cheese like Roquefort. 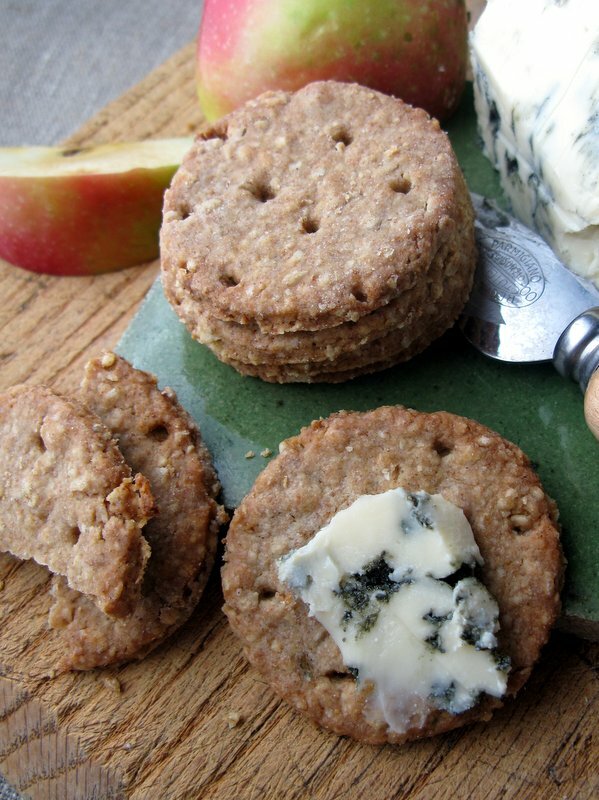 But omit it entirely if you want to serve the biscuits with a wider variety of cheeses. The dough is easy to roll out. I dust a silicone mat with flour then roll directly on the mat for easy of cleanup. 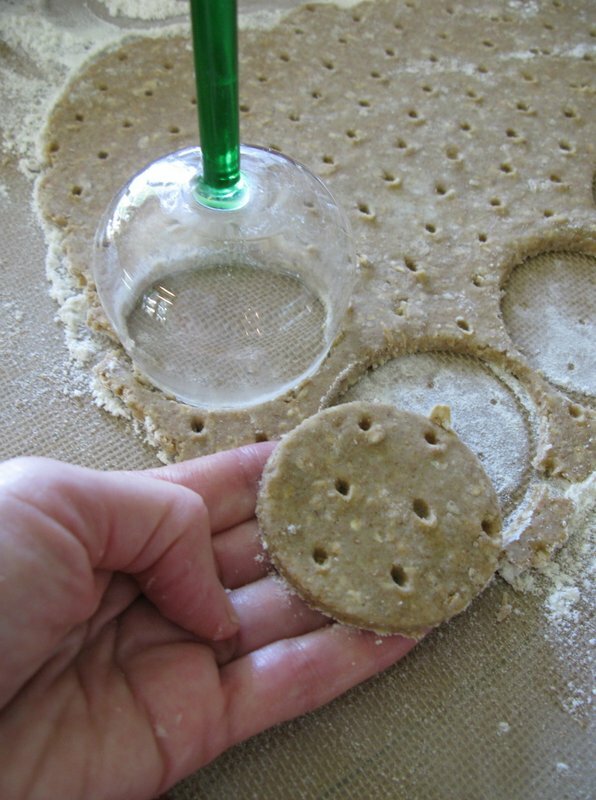 To keep biscuits or crackers from rising during baking, the dough is docked. Docking means piercing the dough with holes. You can do this with a fork or a rolling docker like the one shown here. Something as simple as a wine glass works perfectly well for cutting out the dough even if you have drawers full of special tools. Preheat the oven to 350°F. Grease or line two baking sheets with parchment paper. Place 1 cup of the rolled oats, the whole wheat and rye flours, salt, baking powder, sugar and ginger in the bowl of a food processor fitted with the metal blade. Pulse 3 or 4 times to blend the ingredients. Cut the butter into 8 pieces. Add to the dry ingredients. Process the mixture for 20 or 30 seconds until the mixture comes together into a crumble dough and no pieces of butter are visible. Dump the dough into a bowl. Add the remaining ¼ cup of rolled oats and the sour cream. Blend them into the dough using a stiff spatula or your fingers. Gather the dough up into a ball. Wrap it in plastic and chill until it is firm, for about 30 minutes. Generously flour a worktable or silicone baking mat. Roll out the dough about ¼-inch thick using a well floured rolling pin. Pick up the dough as you roll and make sure there is enough flour to keep it from sticking. Pierce the dough in parallel lines with the tines of a fork. 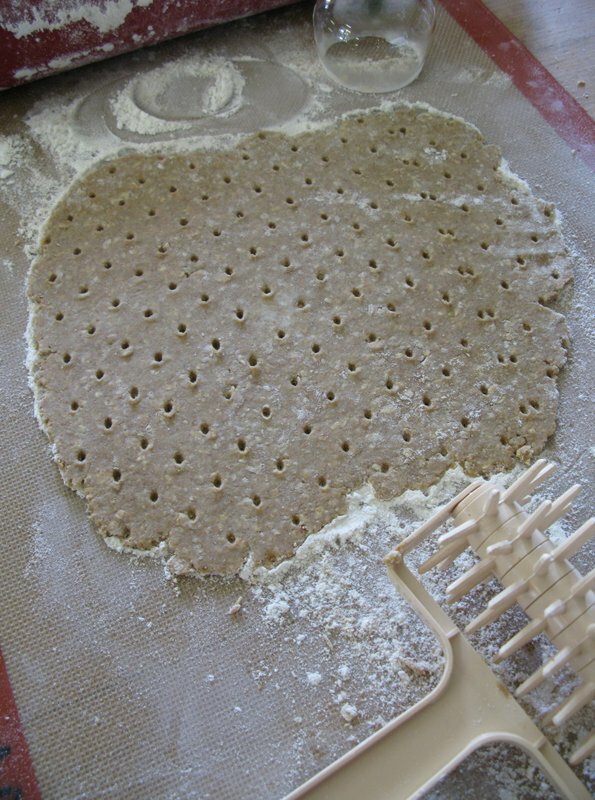 Then cut into 2- to 2 ½-inch circles using a cookie cutter dipped in flour. (I use an Alsatian wineglass and press gently.) Transfer the cut-out dough to the baking sheets spacing each piece 1-inch apart. Bake until the biscuits are evenly browned, for about 12 to 15 minutes. Cool completely before serving. For a sweeter, more cookie-like treat, add 2 Tablespoons of finely diced candied ginger to the dough. For a more savory biscuit, omit the powdered ginger entirely.